CDR BeerLab® attended to Craft Brewer Conference in Denver, April 8 – 11. 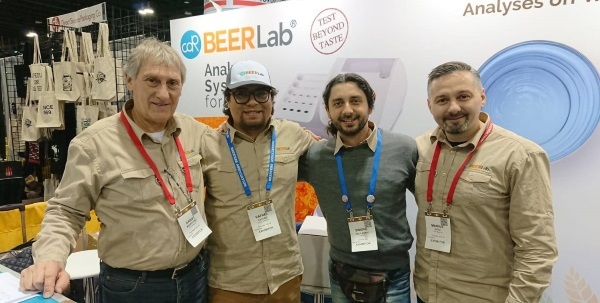 With hundreds visitors to our booth from United States, Canada, Mexico, Argentina, Brazil and other countries, with 3 CDR BeerLab® analysers sold in the days of the exhibition and with the nice people met and several beer tasted: we are very satisfied and we hope to be helpful for the improvement of the quality of the beers. CDR has participated with Quartz Analytics, one of CDR distributors in USA. Gabriele Casini, CDR FoodLab® Sales Manager says: “It was exciting to work at the booth with our partner Quartz analytics. By now our relationship is well-established and we are very satisfied with their work. We’re back in Italy full of energy and ready to satisfy all the needs coming from around the world”. CDR BeerLab® at Craft Brewer Conference in Denver April 8 – 11 2019 was last modified: April 17th, 2019 by CDR s.r.l.